Floor Size	 7'4" x 4'7" x 3'9"
This is an excellent three-season backpacking tent, priced right for budget-minded backpackers. The 2018 updated version of the Midori solves some of the concerns of the previous design, giving a second vestibule and entrance, and changing the venting options, while maintaining a good amount of headroom and solid weather-proof design. I am a longtime fan of EUREKA! 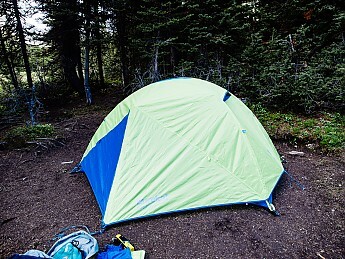 tents, and currently own the tent of my dreams (also reviewed by me here on TS, a Timberline SQ4), but that big boy is wholly too big for solo or two-person trips, and so I found myself looking for a smaller tent for just such a purpose, and one that would stay within my budget which is moderate but not unlimited. Enter the Midori 2 Plus! I was intrigued by the previous model, which was the original Midori, but balked at buying it because of the single vestibule and door. No one wants to be having to climb over their friend to enter and exit a tent. So I kept shopping and waiting, until lo-and-behold, EUREKA released this model last year, and it resolved the biggest issue with the original Midori by adding on a second door and vestibule! And so I jumped on it the very first moment I saw a sale, and got a little bit of use out of it last summer. In preparation for this year, I thought it might be worthwhile to organize my thoughts on this tent and share them with the world. For what is otherwise basically an upmarket budget tent, the Midori 2 comes with a nice number of features that even some higher priced tents fail to include. My favorite is the gear loft—far too often forgotten in tents—which though small is extraordinarily useful. There are also pockets at each corner so lots of easy-to-access spots for glasses, kleenex, cell phones, etc. EUREKA included a spreader bar in their design for this tent, which helps to open up the headspace on the inside of the tent, giving you a lot more space to live in this tent as opposed to merely laying down and going to sleep. I can almost sit up comfortably while inside. They also incorporated their High/Low venting system, which is essentially a little extra ability to open the bottom of the fly to allow extra air to circulate in, along with a propped up vent at the top of the fly to let moist air back out again. I have always found this system (particularly coupled with a UCO candle lantern) to be very adept at keeping the inside of the tent as condensation-free as possible. 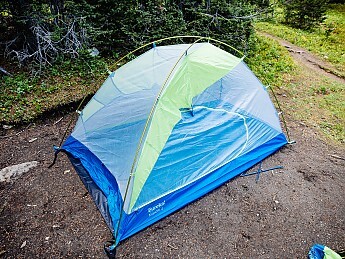 This tent is, depending on your tolerance for extra grams, right at the upper limit of backpackability, in my opinion. It is sub-5lbs (excluding footprint) but can be pitched with only the footprint and fly if you really wanted to cut down on weight. The fabric is very lightweight, the zippers and other hardware similarly light, and the walls of the tent are almost entirely mesh, which helps keep the overall weight down. It also packs quite small, equivalent to perhaps two Nalgene bottles stacked end to end. I've carried it myself up and back down a mountain and not had a problem with the weight, but your mileage may vary. Setting this tent up is easy as any other cross-pole dome tent, so there's little to comment on here. The poles are DAC aluminum and they snap together very satisfyingly, and EUREKA has thoughtfully color coded all of the various corner webbings and whatnot to make it as simple as possible. On the initial setup it did take me a bit to adjust the footprint to sit properly under the tent, and it can be a little bit fiddly to get it *just* right, but mostly it was every bit as easy as you'd imagine a two-pole dome tent to be. The stock pegs needs to be replaced if you have any ambition to venture outside of your backyard, however. They're the same essentially useless wire pegs that come with every budget tent. Do yourself a favor and never, ever use them. I substituted DAC J-stakes immediately and haven't regretted it for a moment. I haven't had the joy or pain to use this tent in extreme weather yet, but I did have to sit out a couple showers and set up on a windy day once. The fabric is very lightweight, but I found the weatherproofness of this tent to be wholly satisfactory. In particular, the fly (when properly staked out) gives sufficient coverage right to the ground, and holds itself far from the walls of the tent, so I stayed dry all night on one particularly wet evening. The tent is asymmetrical from head to toe, with more shoulder space on the front/head end of the tent and less near the feet. The spreader bar lifts the walls of the tent up and away from your headspace, giving ample room to sit up and be comfortable in what is otherwise a very small tent. For two adult bodies there is just enough room to sleep side by side without needing to cuddle too aggressively, and the addition of the second vestibule gives both users ample gear storage space. The single vestible on the older Midori was larger and had more useful space, but the addition of a second vestibule far outweighs any size loss. 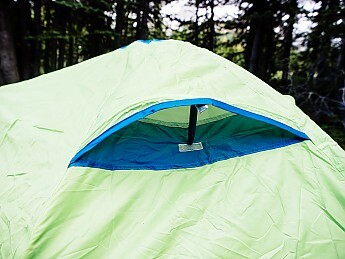 The fabric on this tent seems thin to me; thinner than my Timberline, certainly, which I purchased the Outfitters model of in anticipation of my kids doing a number on it. Having only slept in it for four night on three separate occasions, I can't speak authoritatively as to the ultimate durability of this tent. I can say that it seems to have been well and thoughtfully crafted and held up very well to all of my use and abuse in as little as I've put it through. The DAC poles in particular I really appreciate, especially if I ever have to go back to assembling cheap fiberglass poles. If you can't already tell, I am certainly able to wholeheartedly recommend this tent to anyone on a budget looking for a capable tent for backpacking, or any adventure where a lightweight shelter is required. It checks off all of the basic boxes that I need as an amateur-to-intermediate backpacker, and matches up well feature-to-feature with other mid-market backpacking tents like the REI Half Dome 2 or MEC Camper 2. Thanks for sharing all of this helpful info, Jayson! I'll look forward to your pictures and hope the tent continues to work out well for you. 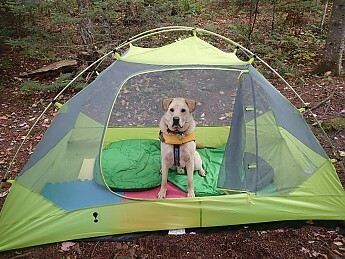 This tent, so graciously provided to me as Trailspace's Reviewer of the Month, arrived just in time for me to use for many solo canoe camping trips with my dog, over the past 2.5 months. I am quite pleased with this tent, as it has worked great for me, as one person and a dog, in nighttime temperatures ranging from 35°f. to 60°f. I have used this tent only as a solo tent...well, me and my 72 lb. lab mutt. I have not carried it while backpacking, but its weight at less than 5 lbs. (4lb 7 oz) , seems reasonable. I use it for canoe camping; it packs nicely in the provided stuff sack, then it fits easily into a 20 l. dry bag. I have found it easy to set up, with only two aluminum poles to insert into the corner grommets. 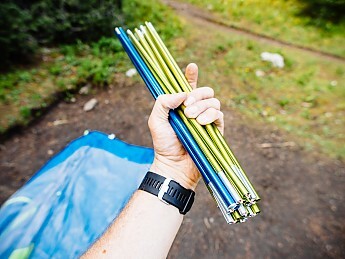 The tent has nice clips, to easily attach it to the poles. 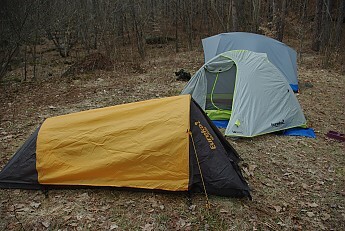 I do use a non-Eureka footprint , which is not specifically sized for this tent; the Midori 2 is 7' 4" x 4' 7" x 3' 9". The footprint definitely helps protect the floor, and keep it cleaner. The tent is made of polyester taffeta, and though lightweight, it seems durable, and has worked well to protect us from rain, and cold (down to 35°f. so far). It has a nice mesh door, with zippers that have worked well, without any snagging. The tent has a bathtub design, so the sides come up a ways, to protect from ground moisture. I did have to give the dog a few reminders on going OVER the entrance area raised portion..he caught on quickly though, and loves his tent! 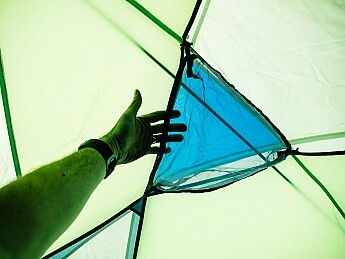 The fly has a color coded corner webbing attachment, nice for when I am stumbling about trying to get the tent up quickly. Once set up, the tent has withstood strong winds at a shoreline campsite, as well as some rain. 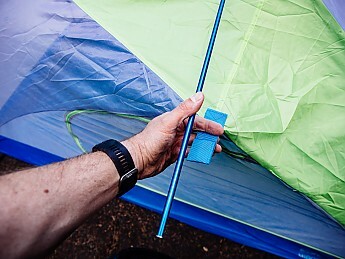 I do have to remind myself to unhook the fly to tent toggle attachments before I take down the tent...I do not want to pull off the fly, and possibly rip or tear one of these three attachment points. The tent is 4'7" wide at head end, and only 3'9" at foot end. This sizing could make for some very cozy nights, if two adults were sharing the tent. The headroom (center height) is 3'7". However, with the gear loft attached,and gear in the mesh loft, that headroom shrinks. The loops to attach the four corners of the mesh net gear loft are very small; I have found it sometimes tricky to get the larger plastic hooks through the loops, in order to attach the loft to the ceiling. My version has two corner mesh pockets; they are triangular shaped, but are not very deep, so hold only a few small items. The tent has a vestibule, with a short pole, that is not removable; I have to be diligent about positioning this pole parallel to the direction I roll up the tent, when packing up. The vestibule has been handy for keeping gear outside the tent. I have a friend, who also uses this tent. She also solo camps with her big dog, and her dog likes to swim, and so gets wet, so...Gabe spends many of his night in the vestibule area. Reportedly this works quite nicely for him, and he has room to sleep on his mat while under the fly vestibule. There is a small vent at the top of the fly, held open with a very short pole section, that has velcro to hold it in place. I am not sure how much effect this little vent has, but I have noted no issues or problems with moisture, or condensation; the tent has never felt "stuffy". The tent reportedly uses a system designed to improve venting...whatever the system is, it seems to work nicely for us. I haven't gotten wet yet, and my gear stored inside, and under the vestibule, has also stayed dry. I did treat the fly with Nikwax solar/waterproofing, which was easily applied, and had no discoloration effects on the tent material. We really like this tent! 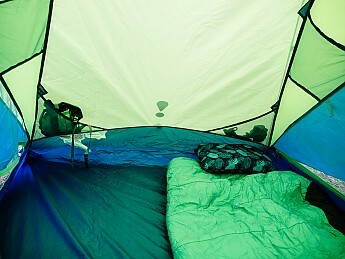 I feel confident it will go with us on many more adventures, and I am comfortable in recommending this tent to others. 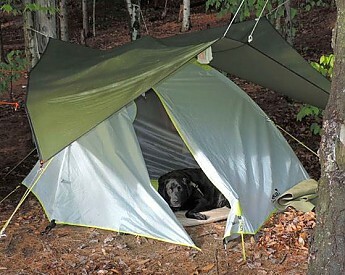 I'm glad to see and hear that the Eureka tent is working out well for you and your pup, Sheila. Thanks for taking the time to let us know in a review. 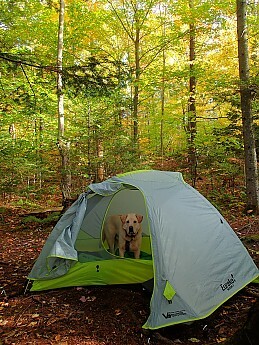 And I just want to add that dogs in tents make for great pictures! I'll have to check one out. Eureka is only 3 miles from me. A good value in a two-person, sub-5-pound backpacking tent. I have owned and used Eureka tents for over 20 years and have been very satisfied with their performance and durability. When my early '90s-era Eureka Timberlite 3 started showing signs of its age, it was time to upgrade that tent. My Eureka Timberlite 3 is spacious for two people and durable. So I replaced my Timberlite with a Midori 2. 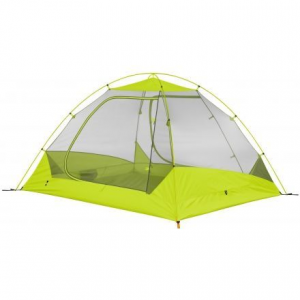 The Midori is an aluminum 2-pole, X-frame dome tent with one side door and one vestibule. The weight is less than 5 pounds, and the pack size is 5" x 18". The setup of the tent is very simple and straightforward. The only slight speed bump is setting up the vestibule stake with the stakes included. Getting the tent back into the included stuff sack was not a problem either. During my use of the Midori I have not experience any high wind, but I feel moderate wind would not be a problem if properly staked. In addition there are several guy-out points that I did not use that would provide additional stabilization in moderate winds. I did experience rains in lots of intensity and duration. One rainstorm was an intense mountain storm with sleet and a creek flowing under the tent. Another rain was a two-day nonstop event. During both cases, the tent performed well. Even with a small creek flowing under the tent in an intense downpour it was dry inside. During the two-day, steady nonstop rain, condensation was forming inside the tent, but it was never an issue that dripped inside the tent. I think the tent performed as well as can be expected in regards to ventilation and condensation. 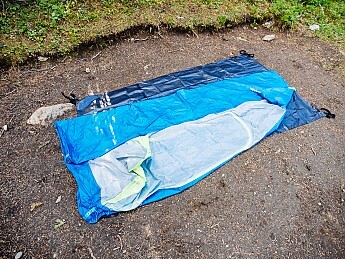 One annoyance in the door opening of the fly was the location of the top of the opening directly over the living space/sleeping bag during a rain. As dry as it was inside the tent during an extended rain, you have to get up at some time to take care of business. I quickly learned to move my sleeping bag away from the opening and zip it back up quickly. Amazingly, the zipper never leaked, and the storm flap works as designed. The big opening provides a huge access for rain to come in and rain drops on the top of the tent to roll in. The Midori comes with a gear loft that will hold more than I would put up there. My wife had it loaded with all sorts of stuff (that takes away from head room when sitting). The vestibule was big enough to keep our boots and stove out of the weather, but not big enough for packs too. The living/floor space is plenty big enough for two people. The tent is long with some room for extra clothes at the foot and head. I am 6-ft tall and had lots of room. 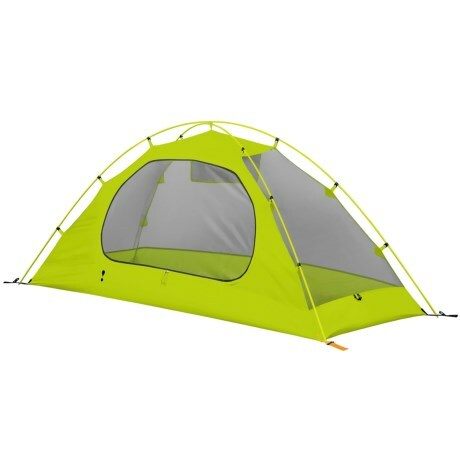 I feel this tent is a good value for someone looking for a light two-person backpacking tent. There is really room for two people, it is less than 5 pounds and packs small. It is not perfect, but once you know the weakness, you can work around them. The included stakes will work, but I would replace them before straightening them out. 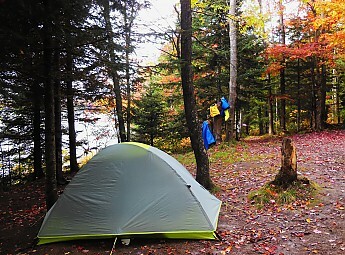 Thanks for sharing your tent review and a pic, Jimbow. Good tent that does what it's supposed to. Only one door and vestibule, and it's hard to stuff rather than roll. 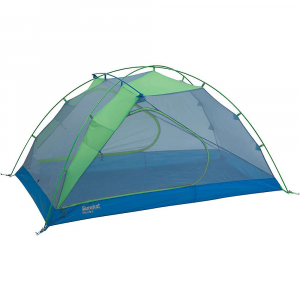 This is a sturdy little tent that is pretty easy to set up. They use a toggle and loop system at the top where the poles cross, which is a little bit difficult when your fingers are cold or you are wearing gloves. The rest of the poles are connected with simple clips. Once set up the tent is quite sturdy and can take some decent winds and rain without issues. The rain fly has plenty of tension points for the really windy days. The tent is perfectly roomy on the inside as long as you are close with your tent mate, otherwise it might be a little bit tight. The single vestibule is very large and has enough room for two packs and a dog because of the smaller pole holding it up to add more volume. This pole however has turned into one of my biggest dislikes on the tent because it is not removable. If you stuff your tent rather than fold and roll this tent is probably not for you because the vestibule pole will get in the way while you try to stuff it in the bag. It has a large removable gear loft that works great, although taking removing and re attaching it is a little bit more difficult than I would like. It seems like a durable tent that would last many seasosn as long as I don't poke through it with that vestibule pole. I have used the tent for one season in the High Unitas and the Wasatch Mountain Range. Great deal! The only downfall is one door, but for the price I'll take it! This was my first backpacking tent that I ever used and I have no complaints. The price was perfect for a first timer's tent. I have not tried it in windy, rainy weather yet. I thought it slept two comfortably.